This site is a member of the FLGenWeb Project under the USGenWeb Project and the independent FLGenWeb Project, Inc. Coordinator Notes (posted on 25 Oct 2011): I am sad to announce that the Genealogy Club of Osceola County has disbanded and no longer sponsers this site. The Club has graciously given permission to leave any and all previously posted information produced by and copyrighted by the Club to remain on the FLGenWeb/USGenWeb site. Publications previously offered for sale by the club can now be found at the Osceola County Historical Society and/or the St. Cloud Heritage Museum (see Resources page). In March and April, 1996, a group of genealogists organized the KentuckyGenWeb project. This grew into the USGenWeb project, and eventually the WorldGenWeb project. At the same time, volunteers were found who were willing to coordinate the collection of databases and generally oversee the contents of the web page. The FLGenWeb is an outgrowth of that original Kentucky Project. 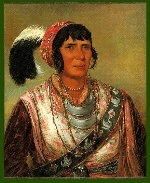 Osceola county was named after the Seminole Indian, Osceola (spelled Aseola by the original artist). Osceola became a hero to the Seminole Indians of Florida when he formed guerrilla resistance to the United States' demand that the Indians leave their home for the territories in the West. An interesting link with more history of Osceola. FLGenWeb Project Digital Library and Archives, or our neighboring counties: Brevard, Indian River, Lake, Okeechobee, Orange, and Polk.